Position of the Hubble Ultra Deep Field in the night sky. The Hubble Ultra Deep Field, or HUDF, is an image of a small part of space in the direction of the constellation Fornax. It took more than 3 months to capture this image, from September 24, 2003 to January 16, 2004. It is the furthest image of the universe ever taken by humans. In it we see the universe as it was 13 billion years ago, when it was about 800 million years old. The HUDF contains an about 10,000 galaxies. The patch of sky where the galaxies are was chosen because it has few bright stars in the near-field. Although most of the targets visible in the Hubble image can also be seen at infrared wavelengths by ground-based telescopes, Hubble is the only instrument which can make observations of these distant targets at visible wavelengths. Southwest of Orion in the Southern-Hemisphere constellation Fornax at right ascension 3h 32m 40.0s, declination -27° 47' 29" (J2000), the image covers 36.7 square arcminutes. This is smaller than a 1 mm by 1 mm square of paper held 1 meter away, and equal to roughly one thirteen-millionth of the total area of the sky. The image is such that the upper left corner points toward north (-46.4°) on the celestial sphere. The star near the center of the field is USNO-A2.0 0600-01400432 with apparent magnitude of 18.95. In total, the image required 800 exposures taken over the course of 400 Hubble orbits around Earth. The total amount of exposure time was 11.3 days for the ACS and 4.5 days for the NICMOS. On September 25, 2012, NASA released a more refined version of the Ultra-Deep Field called the eXtreme Deep Field (XDF). The XDF reveals galaxies that span back 13.2 billion years in time, revealing a galaxy theorized to be formed only 450 million years after the big bang event. On June 3, 2014, NASA released the Hubble Ultra-Deep Field image composed of, for the first time, the full range of ultraviolet to near-infrared light. On January 23, 2019, the Instituto de Astrofísica de Canarias released an even deeper version of the infrared images of the Hubble Ultra Deep Field obtained with the WFC3 instrument, named the ABYSS Hubble Ultra Deep Field. The new images improve the previous reduction of the WFC3/IR images, including careful sky background subtraction around the largest galaxies on the field of view. After this update, some galaxies were found to be almost twice as big as previously measured. 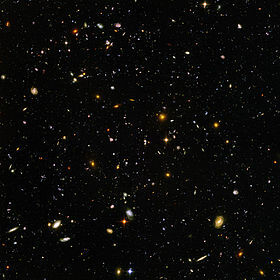 ↑ 1.0 1.1 "APOD: 2004 March 9 - The Hubble Ultra Deep Field". apod.nasa.gov. 2012. Retrieved 7 March 2012. ↑ Chang, Kenneth (2008-03-09). "Gauging age of Universe becomes more precise". New York Times. Retrieved 2008-09-24. ↑ The image yields a rich harvest of about 10,000 galaxies. ↑ "NASA - Hubble digs deeply, toward Big Bang". nasa.gov. 2007. Retrieved 7 March 2012. ↑ "Hubble goes to the eXtreme to assemble farthest-ever view of the Universe". NASA. 25 September 2012. Retrieved 26 September 2012. ↑ "Instituto de Astrofísica de Canarias - IAC - Educational Outreach". www.iac.es. January 24, 2019. Retrieved 2019-02-05. ↑ Martínez-Lombilla, Cristina; Akhlaghi, Mohammad; Cardiel, Nicolás; Dorta, Antonio; Cebrián, María; Gómez-Guijarro, Carlos; Almagro, Rodrigo Takuro Sato Martín de; Lumbreras-Calle, Alejandro et al. (2019-01-01). "The missing light of the Hubble Ultra Deep Field". Astronomy & Astrophysics 621: A133. doi:10.1051/0004-6361/201834312. ISSN 0004-6361. https://www.aanda.org/articles/aa/abs/2019/01/aa34312-18/aa34312-18.html. ↑ Borlaff, Alejandro; Trujillo, Ignacio; Román, Javier; Beckman, John E.; Eliche-Moral, M. Carmen; Infante-Sáinz, Raúl; Lumbreras, Alejandro; de Almagro, Rodrigo Takuro Sato Martín et al. (January 2019). "The missing light of the Hubble Ultra Deep Field". Astronomy & Astrophysics 621: A133. doi:10.1051/0004-6361/201834312. ISSN 0004-6361. http://arxiv.org/abs/1810.00002. This page was last changed on 19 April 2019, at 10:28.